Winco WDM004-203 Ardesia Priscila White Melamine Angle Bowl 8-1/2"
TigerChef > Dinnerware > Melamine Dinnerware > Melamine Serveware > Melamine Bowls >< Melamine Serving Bowls > Winco WDM004-203 Ardesia Priscila White Melamine Angle Bowl 8-1/2"
$84.19 Winco WDM004-201 Ardesia Priscila White Melamine Angle Bowl 6-1/2"
$100.25 Winco WDM003-203 Ardesia Hailey White Melamine Angle Bowl 16"
An indispensable addition to any dinnerware collection, the Winco WDM004-203 Ardesia Priscila White Melamine Angle Bowl 8-1/2" is perfect for serving entrees and appetizers. Capturing the look of delicate ceramic, this NSF listed bowl has a smooth, pristine white surface that perfectly complements any table setting. Thanks to its angled rim, this bowl adds a modern yet elegant touch while providing excellent product visibility. 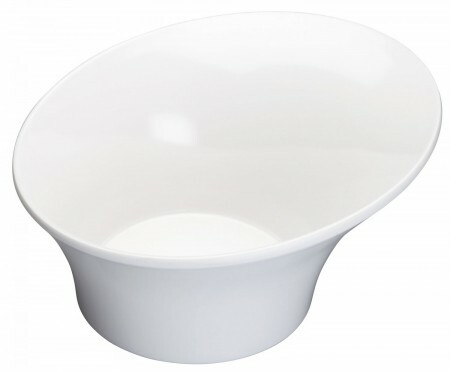 Made from high quality melamine, this break-resistant angle bowl provides unbeatable durability.